“He is not here; he has risen, just as he said. Come and see” (Matthew 28:6). 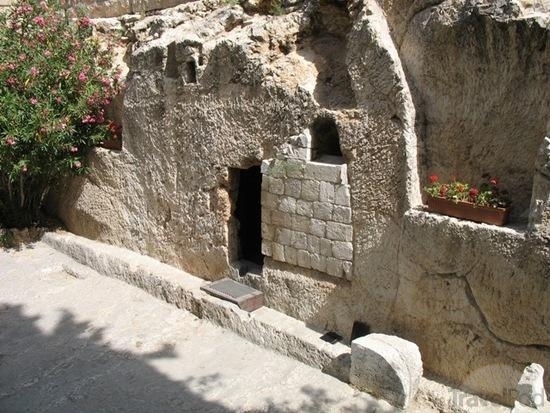 Two sites claim to be the burial site of Jesus. The one we didn’t see on any of our three trips to Israel is the source of much conflict. Six or seven churches have established shrines there and each will tell you, vehemently, that their little corner is the exact spot where Jesus died. We went, instead, to a garden just to one side of a small hill, a hill on which you can see the indentations of a skull if you squint just right. It’s not the enormous hill you picture when you imagine those three crosses. It’s short enough that hecklers below could easily call up insults. It’s short enough that a man nailed and dying could easily look down and see his mother’s devastated eyes. “We think this is Golgotha,” our guide said. “Skull Hill.” Whether it got that name because of the eye socket-, nose- and mouth-indentations on the side or whether it was because criminals were tossed over the side of that cliff and their bones left in a rotting heap, he didn’t know. I shuddered to imagine the fear a condemned man would feel as he looked down on that pile of untouchable shame, knowing his bones would soon join the skeletons of those other sinners below. When the group ahead of us had finished, we took our turn at the tomb. It felt surreal to walk up to the exact spot (I’m convinced) where they laid Jesus’ lifeless body — the same spot where, three days later, the breath came back in his lungs and his fingers twitched and his eyes opened again. I’m still not over the wonder of it. Our guide gave us some background about this particular tomb. “We know whoever owned this tomb had money. First, the cave contains two slabs. This meant that if there were two deaths in the family, they’d be prepared for both bodies.” He told us that when we went inside, we’d notice that one slab had an area carved out for feet; the other did not. That indicated that only one slab had ever been used, and for whatever reason, after that one body had lain inside, they never finished the second slab. From outside, he pointed to a small window above and to the right of the door. “That’s a soul window,” he explained, “and that’s the second reason we know this tomb belonged to someone wealthy.” Bodies were kept in tombs until the flesh rotted away and only bones remained. Those who could afford to do so often had small ventilation windows cut out so the odor of decay could escape. John outran Peter. He reached the tomb but did not go in. And somehow, filling that small doorway — and blocking the light from outside — he was able to see Jesus’ burial cloths lying on the slab. The door to that tomb has been enlarged over the years. But if it were small enough then for John to have to stoop down to look through, he would have blocked the light from outside. That meant in order to see the slab, there had to be another light source. When you stand in the doorway of this particular garden tomb, a shaft of light from the “soul window” pierces the darkness of that room and shines directly on that one finished slab. I didn’t cry when I entered that small room and stood and stared down at the empty slab. Instead, I thought, You’re not here. The bones of every prophet, every great teacher, every king and emperor and religious leader throughout history can be found right where they were laid. But this room is empty. He lives.